I have tons…literally TONS of oregano growing in the garden. And oregano’s a pretty strong herb, so it’s not like I can use a ton of it in one dish. When I think of oregano, I immediately think of Greek food (maybe it’s because I have that plant sticker in the pot that says “GREEK OREGANO”). Subliminal messaging, perhaps. Anyway, I got to thinking about what to do with it and got the idea of making some meatballs…lamb meatballs, to be exact. I am a huge lamb fan, but you could just as easily substitute beef, pork, chicken, or turkey. Lamb is probably one of my favorite meats – it has great flavor on its own and goes really well with a lot of the spices I like to use. 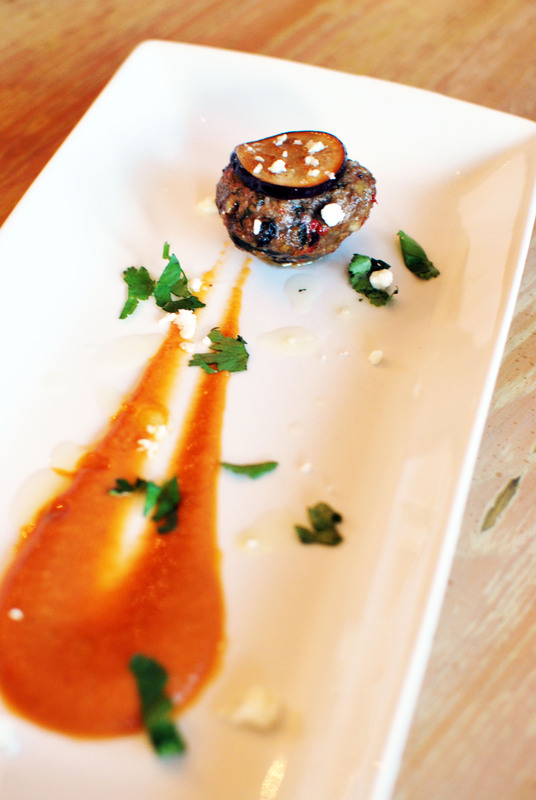 The sauce is made with tomatoes and eggplant – another Greek twist. And I crumbled some great feta cheese on top. Can you really go wrong with meatballs, sauce, and cheese? I certainly don’t think so. I served this as part of a bigger lamb dish at supper club, but it would be great as an appetizer or tossed with some pasta. Everytime I walked by the fridge, I would snack on one. It’s truly a great recipe. I hope you guys enjoy it! Preheat the oven to 400 degrees F. Combine all the ingredients into a bowl and mix until combined. Roll the meat into balls, about 2 ounces each. You’ll have about 16 meatballs. Place the meatballs on an oiled cooking sheet tray. Roast the meatballs for about 20 minutes, until they are firm – about 130 degrees. Get a pan over medium heat and add the oil. Add the garlic, shallots, cinnamon stick, and bay leaf to the pan. Cook until soft and aromatic. Add the eggplant and oregano and season with salt and pepper. Cook the eggplant until it’s slightly soft, about two minutes. Add the tomatoes and two cups of chicken stock and allow to simmer, about 10 to 15 minutes. Remove the cinnamon stick and then put the sauce in a blender. Blend until it’s completely pureed and then strain the sauce into a clean saucepan. If the sauce is too thick, thin out with some chicken stock. If it’s good, whisk in the butter until melted and season to taste with salt and pepper. Coat the eggplants in the cornstarch and shake off the excess. Fry in 360 degree oil until golden brown and crispy. Season with salt. Put some of the sauce on a plate and top with the meatballs. Top each meatball with an eggplant chip. Sprinkle the feta cheese and chopped herbs over the plate. Drizzle with extra virgin olive oil and serve! What are your favorite meatballs? Anyone have a favorite recipe? ← Taste of Music City and Savor Nashville Celebrity Chef Dinner! Not a fan of raisins, however I always use them in my meatballs. The secret is out! This looks really good..! and the ingredients sound like an amazing combo! will have to make this sometime..